COMPETITION CLOSED! Thanks to everyone who entered! This striped tiger’s tale, adapted from the original book by Judith Kerr, is all about friendship, the joy of sharing, and (in my humble opinion) a rather impolite dinner guest! 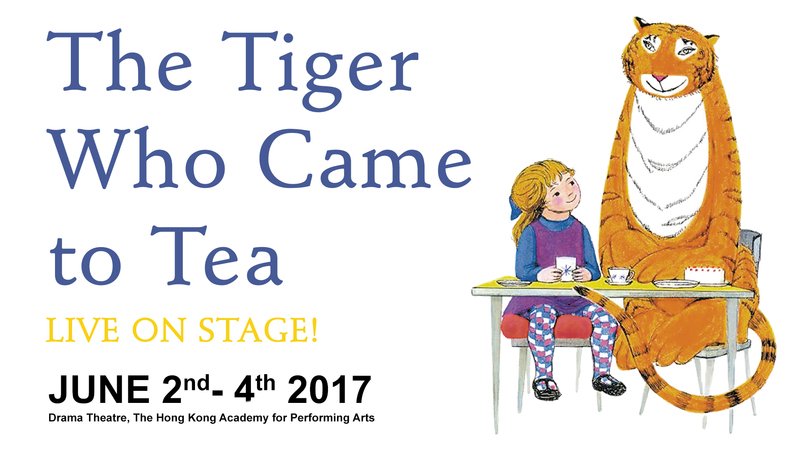 You can catch up with Sophie and her feline friend this June, as The Tiger Who Came To Tea hits the stage here in Hong Kong. I have four tickets to give away to the opening night performance on Friday June 2nd at 5pm. All you have to do to to be in with a chance of snagging this great prize is to ‘like’ both The Accidental Tai-Tai and ABA Productions Hong Kong Facebook pages and answer the following, being as creative as you can be. The performance will take place at the Drama Theatre, Hong Kong Academy for Performing Arts, Wanchai and is suitable for kids aged three and over. I’ll select one lucky winner this Friday, 26th May, and will contact them by email with details of how to claim their prize. Thanks to ABA Productions Hong Kong for sponsoring this tasty prize!